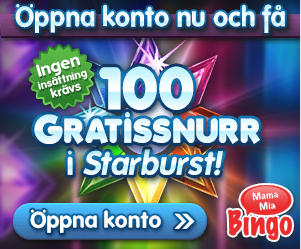 Mama Mia Bingo is an online gambling place where you may also have the opportunity to play bingo. This Scandinavian website has been created to offer the gaming capabilities to Finland, Sweden and Norway. As the layout indicates the graphics have been made to bring a relatively easy to use interface that can be manipulated to find what you are looking for. The games are being supplied by the Net Entertainment, a top gaming platform when it comes to Internet software. All your favorite slot titles coming from this studio were included so be prepared to meet the popular characters. A reliable encryption system is guarding every entrance from any possible threats that may indicate during the game play. The Random Number Generator tests the software for full compliance with the platform so that any single outcome would provide only unpredictable outcomes. There is also a firewall application to prevent the attacks from outside. The brand is fully licensed under the jurisdiction of the Lotteries & Gaming Authority in Malta. Every bonus promotions which may be granted to the players will bring you more exciting chances to score and have some spare chips to spend at the preferred games of your choice. Although the site is mainly a Bingo service, there are also plenty of casino games available in the collection. The majority of them are Video Slots that include such titles as: Big Bang, Big Bad Wolf, Secret of the Stones, Super Safari, South Park, Immortal Romance, Magic Portals, Reel Rush, The Codfather, Thunderstruck II, Fisticuffs, Emperors Garden, Doctor Love On Vacation, Eggomatic, Andre The Giant, Silent Run, Teddybear’s Picnic, Enchanted Mermaid, Maid O Money, Munchers, Pizza Prize, Muse, Egyptian Heroes, Foxin Wins, Irish Eyes 2, Wild Turkey, Joker Jester, Thief, Pacific Attack, Champion of the Track, Crusade of Fortune, Genie Wild, Fairies Forest, Victorious, Boom Brothers, Elements, Magical Forest, Mad Mad Monkey, Gold Raider, Doctor Love, Medusa, Disco Spins, Lucky Angler, Merlin’s Millions. Those who prefer the Classic Slots, you may want to try Magic Love, Lucky 8 Line, Super Nudge 6000, Mega Joker, Jackpot 6000. The customer support is available through telephone, live chat and e-mail. Banking options usable on the website include Neteller, Visa, MasterCard, Click2Pay, Skrill Moneybookers, Instant Bank, entropay. The language versions of the interface are in English, Finnish, Swedish, Norwegian. Be sure to check any information regarding the rules as there always is something important to adhere.